Your regular dentist will refer you to Dr. Brown’s office when your treatment requires the specialized services that Dr. Brown can provide. To relieve any fears and apprehensions you may have concerning what to expect and the treatment needed, Dr. Brown’s well-qualified and experienced staff will explain in detail your individualized treatment plan, the length of time it will take to complete the treatment, the cost and answer any questions you may have. Dr. Brown and her staff want you to receive the best care possible in a welcoming and comfortable environment. From the beginning stages of gum disease to cosmetic or more advanced procedures, Dr. Brown offers these non-surgical as well as surgical services. 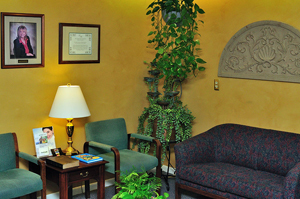 We are pleased to provide options for oral sedation. Nitrous oxide and oral sedation can be used to decrease patient anxiety and increase comfort during our procedures. Please ask about this service if you are interested in learning more. Periodontal disease can progress to a point where the only effective treatment is periodontal surgery. This is minor surgery using local anesthetics that is performed in Dr. Brown’s office. Deep pocket formation in the tissues surrounding the teeth, bone loss, and teeth roots that are exposed due to gum recession (pulling away from the teeth) are conditions that can be treated with surgical techniques.